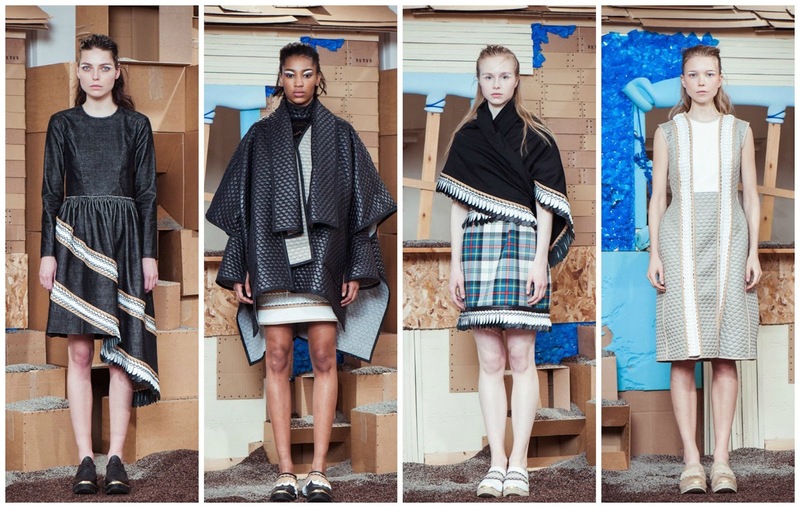 During London Fashion Week, there are four Irish designers currently presenting. Paul Costelloe, Orla Kiely, Simone Rocha and Danielle Romeril. Paul Costelloe is perfecting the 60’s, Orla Kiely the 70’s. Simone Rocha is drawing inspiration from different eras, and mainly from the world of the arts. Danielle Romeril is an interesting one. Her mood board will feature a place and then it is translated into the future. For Spring 2015, it was a futuristic Wicklow Mountains scene with touches of African safari. For Fall 2015, the collection was called ‘Survive’. Set in a dystopian landscape within the BFC Presentation Space, Romeril had shelters that migrants might’ve built across the world erected. Her set represented the dark future that may await. As a result, the Danielle Romeril girl had to scavenge, salvaging what she could from the desolate and barren terrain. The product was a wide-reaching, interesting collection. Traditional winter cloth was used in new and exciting ways for Fall. Romeril’s designs were sculptural, featuring an asymmetric hemline. A three-tone dress with an asymmetric hemline and the top featured a frayed, folded panel. Romeril used a Japanese technique in her collection. Odoshi lacing was used to combine different materials but in a unique, couture-like way. Odoshi was used on samurai armour. In this instance it added a strength to a collection which was quite fragile. That statement applies both metaphorically and to the design. The lacing added a three-dimensional look to the clothing, as did the technical quilting. Look 13 resembled a samurai’s outfit. Like a samurai’s outfit, the look was complicating and perplexing to look at, but intriguing and beautiful. It was equipped with folds, sculpts. The idea of protective layers carried through the collection. As aforementioned, the collection is an exploration through a dystopia. Sensible shoes were worn, camouflaging outfits. The modern reworking of a samurai costume was another extension of that. Allusions to life jackets were also made in the collection. Danielle Romeril is always one-to-watch. This collection is adaptable and that’s why I rank it so highly. You can see women wearing this collection in an eclectic mix of places. Workwear. For nightclubbing. Daywear. Evening outfits. Transplanted in any environment and this collection would get you far.